The Museums Association (MA) is an independent association representing a wide membership - this includes individual museum professionals, the majority of Britain's museums and galleries and corporate/business members working in the museum sector. The first organisation of its kind in the world, it was set up by a small group of museums in 1889 to look after the interests of museums and galleries. The MA provides information through its website and publications, lobbies government and sets ethical standards through its policy department and offers a comprehensive professional development programme for members wishing to further their careers in museums and galleries. In addition, the MA runs a series of events around museum issues, and holds an annual conference which focuses on current issues and policies affecting museums and galleries. We have worked closely with the MA, provided them with ContentIndex+, our Content Management System and developed the MA website to supply current news and act as a major resource for its members. ContentIndex+ enables MA staff to create, edit, link and manage all content and update the website weekly. The website is a powerful tool furthering the MA's programme of information delivery to the sector with news, events and conferences and issues of best practice including ethics, commercial opportunities and career development. 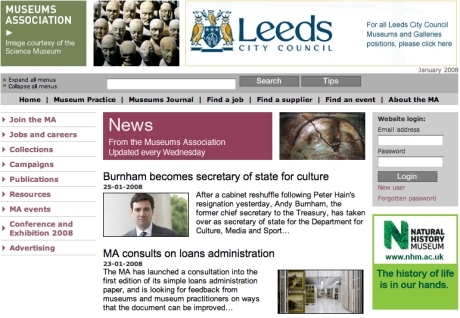 It includes current articles from the Museums Journal, an archive of articles from Museum Practice and a searchable databases of jobs and events.